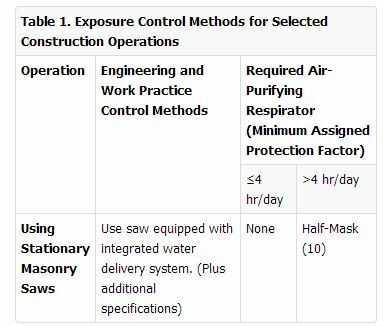 If you haven’t heard, Federal OSHA is proposing to reduce the airborne silica permissible exposure limit (PEL) to 50 µg/m³. It is difficult to say how much lower this new rule will be, since the current standard relies on a calculated formula to obtain the exposure limit. However, to make this easier, let’s just say it’s a 50% reduction in the PEL. This limit is the same at the NIOSH Recommended Limit and above the ACGIH Threshold Value of 25 µg/m³. Before I offer my opinion, you can state yours to OSHA here, and I’d recommend you do. Update the health standards. The original rule was from the 1970s. New products for the industry will be created to control silica, like this. Consultant hygienists will get more $ to: train, air monitor, etc. Alternatives to sampling. This is written in the proposed rule. driveby citations. Look at some of my “caught on camera” overexposures. It is easy to see why this will be easy for OSHA to cite. remember how you felt when you started working with leaded paint? Picture that again. Overall, I think lowering the limit will reduce employee overexposures to silica. The increase in awareness across the US will bring more attention to the danger. Contractor employers who are doing absolutely nothing to control silica will get caught, punished, and hopefully change. For good-contractors out there, this will make it easier to explain to your subcontractors who are a little behind. I can see many contractors using Table 1 as a guide to easily protect employees on short tasks with high silica exposures. Your thoughts? I’d love to hear them. Here is a NY Times Article perspective. Industrial Hygiene in Construction is powered by	WordPress 5.1 and delivered to you in 0.447 seconds using 30 queries.